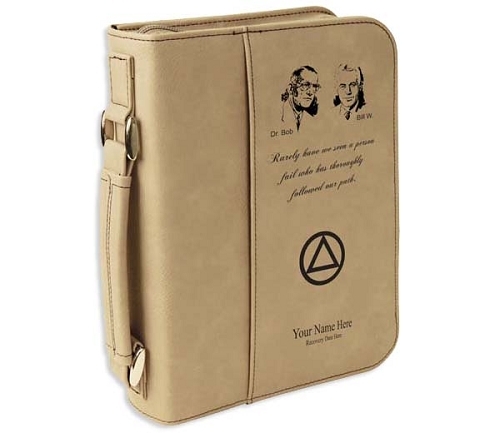 This beautiful leatherette book case is expertly laser engraved with our AA founders and the passage "Rarely have we seen a person fail who has thoroughly followed our path." The AA Circle and Triangle symbol is also engraved as is a name and recovery date at no additional charge! These lovely book cases are very nicely made and have a soft leather feel to them. Each features a sturdy handle and zipper. The Alcoholics Anonymous Big Book fits nicely.